Vox Lux follows the rise of Celeste from the ashes of a major national tragedy to pop super stardom. The film spans 18 years and traces important cultural moments through her eyes, starting in 1999 and concluding in 2017. In 1999, teenage Celeste (Raffey Cassidy) survives a violent tragedy. After singing at a memorial service, Celeste transforms into a burgeoning pop star with the help of her songwriter sister (Stacy Martin) and a talent manager (Jude Law). Celeste's meteoric rise to fame and concurrent loss of innocence dovetails with a shattering terrorist attack on the nation, elevating the young powerhouse to a new kind of celebrity: American icon, secular deity, global superstar. By 2017, adult Celeste (Natalie Portman) is mounting a comeback after a scandalous incident that derailed her career. Touring in support of her sixth album, a compendium of sci-fi anthems entitled Vox Lux, the indomitable, foul-mouthed pop savior must overcome her personal and familial struggles to navigate motherhood, madness and monolithic fame in the Age of Terror. In Brady Corbet's second feature, following his 2015 breakout debut The Childhood of a Leader - winner of the Best Director and Best Debut Film prizes at the Venice Film Festival - Celeste becomes a symbol of the cult of celebrity and the media machine in all its guts, grit and glory. 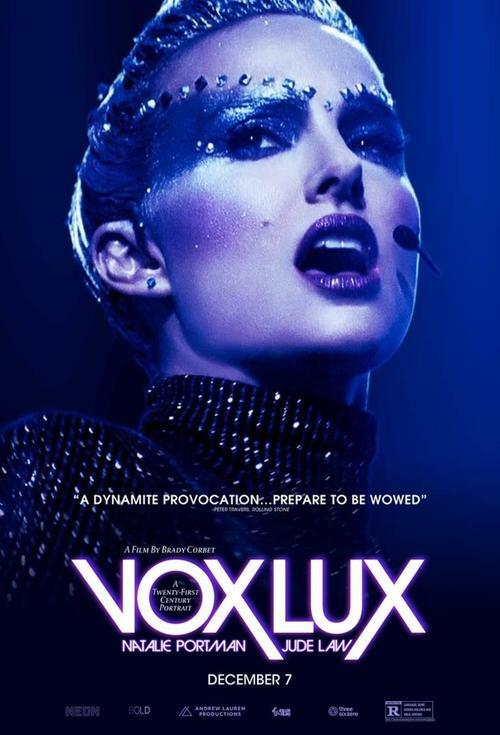 Featuring original songs by Sia, an original score by Scott Walker, and a transcendent performance by Natalie Portman, personifying and pummeling the zeitgeist, Vox Lux is an origin story about the forces that shape us, as individuals, nations, and gods.